Darren is one of a very select group of former Hereford players whose talent was such they excelled when handed an opportunity in the Premier League. Born in Bristol on 3 February 1968 his career began at Newport County as an apprentice, at that time managed by the former Hereford boss Colin Addison. Featuring as a striker Darren impressed immediately and was drafted into the first team squad, making his debut as a substitute for County against Plymouth Argyle in 1985. A fortnight later came his full debut against Walsall, and in his opening season he made a total of 18 appearances for Newport. Crippled by longstanding debt and tumbling attendances Newport struggled and were relegated from the Third Division in 1987, and in 1988 finished bottom of the Fourth Division with a mere 25 points. Darren continued to play for County in the GM Vauxhall Conference but the club went out of business in February 1989 with their results expunged. His professional career was revived here at Edgar Street by boss Ian Bowyer who initially utilised Darren as a striker but was quick to recognise his potential as a centre-half. 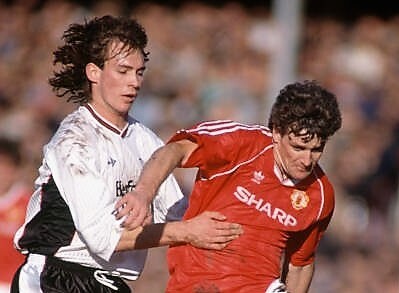 His United debut arrived as a substitute in April 1989, prior to his full debut at Grimsby two weeks later. The next season was his breakthrough year. Darren scored twice against Swindon in the Hereford Senior Cup before grabbing his first Football League goal for the club against Carlisle. His rugged defensive performances and commitment earned him the Player of the Year accolade and the captain’s armband. One of his most memorable matches in a Hereford shirt arose on January 28, 1990 and the small matter of an FA Cup 4th Round tie at Edgar Street against Manchester United. Peacock, Mel Pejic and Chris Hemming produced outstanding displays to nullify the likes of Paul Ince, Mark Hughes, Brian McClair and Danny Wallace. A crowd of 13,777 believed Hereford were about to gain a replay at Old Trafford before a late Clayton Blackmore effort denied the Bulls what should have been a deserved draw. Darren was also a member of the Welsh Cup winning team when in May 1990 the Bulls lifted the trophy at Cardiff Arms Park after beating Wrexham. He had been a doubt for the match but passed an early morning fitness test, and played a part in the opening goal as his knock-down from a Gary Bowyer free-kick enabled Colin Robinson to put Hereford one-up. Wrexham equalised through Gary Worthington, but Hereford went on to win thanks to an Ian Benbow strike. By this time the national scouts were flocking to Edgar Street assessing the centre-half and his potential to play at the highest level. However, it took an initial transfer bid of £200,000 from Queens Park Rangers in December 1990 to secure his move to Loftus Road, thus becoming a then record fee received by Hereford, beating the previous sum received from Notts County for Phil Stant. His tough tackling style ensured he quickly became a QPR favourite and his tremendous passion and presence shone through at the highest level. Such was his consistency it took a staggering £2.7 million fee to prize him away from Loftus Road when moving to Newcastle United in 1994, then managed by Kevin Keegan. Hereford had negotiated a sell-on clause with QPR and so picked up another £245,000 from the deal. Darren may have lacked the star quality of Les Ferdinand, David Ginola and Peter Beardsley but was an integral part of the Newcastle side that so narrowly missed out on silverware. Newcastle supporters first described him as “looking more like a Thin Lizzy guitarist than a Premier League defender” but they were soon won over. 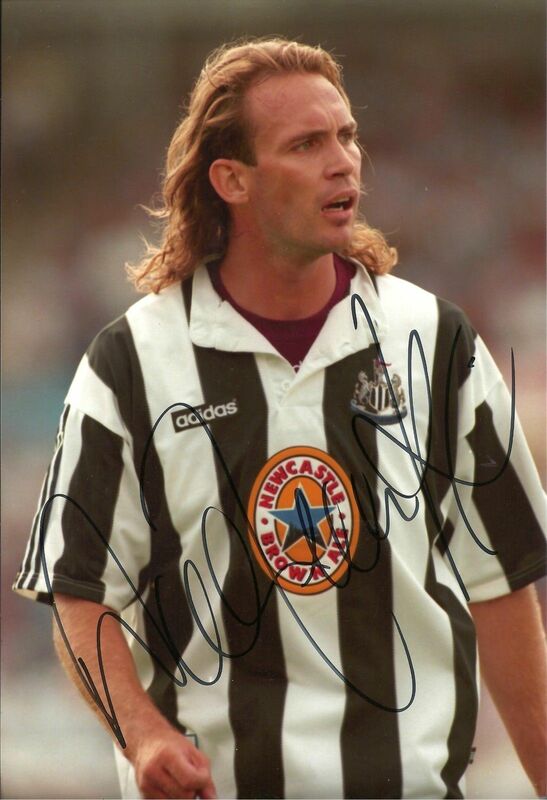 His Newcastle debut came in a 3-0 home win over Norwich City in March 1994, with the Magpies finishing third. His next season saw him alongside Philippe Albert at the heart of the Newcastle defence, and in the 1995/96 campaign Darren was part of a defensive unit that only conceded 37 goals, only marginally more than that of champions Manchester United (35) and third placed Liverpool. Another second placed finished followed in the 1996/97 campaign with Peacock a virtual ever-present in the No 5 shirt and the tantalising prospect of an England call-up that never came. But almost four years after his Newcastle debut, Darren’s last game for the Magpies came in a 0-0 draw at Wimbledon in March 1998 before a free-transfer move to Blackburn Rovers. A succession of injuries curtailed his appearances whilst at Rovers, and Darren spent some time at West Ham and Wolverhampton Wanderers on loan. Indeed, Darren finally hung up his boots in December 2000 after a nasty collision with his own goalkeeper Michael Oakes damaged vertebrae in his neck and compression to his spine. Typifying his spirit he played on despite having been knocked unconscious, and it was only on his return to Blackburn that it became clear how close he had come to paralysis. In recent years a career in property development coincided with a return to football as manager of Northern Premier League side Lancaster City from 2013 to 2105, before coaching with the North Lancashire & District Development Centre. Peacock joined the BBC Hereford & Worcester commentary team last season covering the epic FA Cup tie at Fleetwood Town.